The JEE Main Chemistry Chemical Kinetics is Very helpful for all students. Now Scroll down below n click on “Start Quiz” or “Start Test” and Test yourself. O3(g) + O(g) → 2O2(g)? For this reaction, rate of reaction depends upon the concentration of RCl. It means, the rate of reaction is halved by reducing the concentration of RCl by one half. Activation energy of a reaction is constant at constant temperature hence, E1 = E2. Which represents first order reaction out of I, II and III? If the temperature is increased by 60°C then 10° increase has been made 6 times and therefore, rate will increase by 26 = 64 time. If a certain reaction is first order with respect to A, second order with respect to B and zero order with respect to C then what is the order of reaction? By increase in temperature by 10 K, the rate of reaction becomes double. How many times the rate of reaction will be if the temperature is increased from 303 K to 353 K? By increasing 10 K temperature the rate of reaction becomes double. When temperature is increased from 303 K to 353 K. The rate increases in steps of 10° and has been made 5 times. Hence, the rate of reaction should increase 25 times, i.e., 32 times. 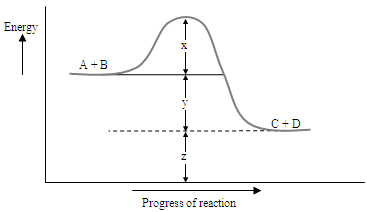 Which of the following graphs represents exothermic reaction? Energy of reactants > energy of product, which is the case given in (i). The reaction rate = k[A][B]. If the volume of the container is made 1/4 of the initial, then what will be the rate of reaction as compared to the initial rate? 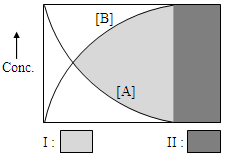 When volume is reduced to one fourth, concentrations become four times. Hence, the rate of reaction becomes 16 times as compared to the initial rate. Which of the reactions represented in these diagrams will show the greatest increase in rate for a given increase in temperature? Logarithm function is linear which is for first order reaction. 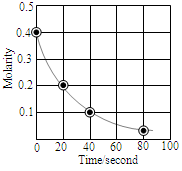 Graph between log [H2O2]t and t is a straight line.